In the course of working with this orgone stuff, I’m planning on constructing a permanent Babalon Matrix in my room: a table specifically dedicated to charging or maintaining a field of force or magical energy for various purposes (charging, manifestation, and the like). However, this is a really modern form of occultism, using various modern theories of force, energy, and methods of harnessing them. As you may have noticed, dear reader, this is not my normal time period; I’m much more Renaissance or classical when it comes to magic and the occult. Plus, ceremonial magicians are renowned (in)famously for making things more complicated and embellished than they have to be, because why else would someone do something if it didn’t look completely badass at the end? Thus, after some experiments with orgone, I decided to try out something new. To that end, I experimented with making a kind of magic circle for my orgone setup. The setup creates a field of magical force or dweomer or somesuch (terms abound for this, but you know what I’m talking about) that radiates from a central core and is reflected or manipulated by perimeter objects, generally crystal bars that are ridged on one side and flat on the other. Philosophers and occultists have long resorted to using symbolic diagrams to represent the cosmos, magical activity, and other immaterial things, so why not create a circle or pattern that can describe such a field? At worst, the pattern would only be decorative, serving to make my orgone system look really really cool and arcane. At best, the pattern would help amplify, guide, and empower the orgone system even more; using patterns or symbols on their own as potent magical tools has a long history in most magical traditions, so this could be fantastic tool. Alternatively, the symbol could create a field that would interact and potentially interfere with the field generated by the orgone system, so I decided to experiment. So, I painted this pattern out onto a piece of posterboard. I used a mixture of consecrated black acrylic paint (leftover from my Circle of Art project), dragon’s blood ink, and a Bardonian simple fluid condenser (chamomile extract, gold tincture/solution, grain alcohol). Painting it alone made me dizzy, and the pattern definitely had a buzz of its own, so I must’ve been doing something right. I took it over to Jarandhel‘s house later that night, and we started running some experiments with it. What was interesting about this pattern is that, when we started putting it to use, it did not describe a spherical field at all. Setting a Babalon Matrix system atop the posterboard and activating it, it felt more like a torch flame or cone in the center with energy being concentrated at the focus instead of being cycled about the entire field. In fact, we noticed that this was still the case even after we removed the Babalon Matrix entirely, and just used the pattern itself as a field. It felt like the posterboard was generating a field of its own; whether this was a result of the paint used to make it, the pattern itself, or some combination of the two was unknown to us at the time. We concluded that the design didn’t describe a sphere, and on some reflection we figured out that it was due to the center circle in the pattern, which isn’t crossed through with field lines (meridians? ley lines?). Because that circle isn’t connected to the rest of the pattern, we reasoned, it doesn’t and can’t actually radiate energy outward; instead, it gathers energy, and acts as a termination point for the rest of the pattern. Thus, energy would flow along the lines and terminate into a single point at the center, resulting in a kind of energetic “spire” or cone. If the first version of the design created a spire of energy due to the central circle being empty, we reasoned that crossing it through would result in a different field shape. We were correct, too: by having the lines cross through this central circle, we attained a stable spherical field. It’s as if the central circle, now being crossed through, was now acting as a “top” rather than a “point”, which allowed energy to both radiate from and collect into the center. This design more accurately described a spherical field, which is what the Babalon Matrix does. Flat side in, no circle: spherical field contained by the perimeter crystals. Flat side out, no circle: radiating field in all directions from the perimeter crystals. Flat side in, spire model, on perimeter circles: a spire of energy gathered at the center in a culminating point. Flat side out, spire model, on perimeter circles: four distinct spheres of energy at each perimeter crystal, about the same size as the circle design itself. Nothing between the crystals or inside the circle. Flat side in, sphere model, on perimeter circles: spherical field contained by the perimeter crystals, stronger than the Babalon Matrix alone. Flat side in, sphere mode, on perimeter angles: a spherical field contained by the perimeter crystals, but it felt “off”, like it was a square peg in a round hole. Jarring. Flat side out, sphere model, on perimeter circles: Four beams of energy radiating from the crystals, one beam per crystal. Not omnidirectional, but unidirectional for each crystal. Nothing really between the crystals except very faint radiation. Flat side out, sphere model, on perimeter angles: Somewhat more even than before, but still felt “off” or blocky. Like trying to make a smooth level out of chunky gravel. Also, a small benefit to these designs is that they’re based on a unit circle (the innermost focus and the perimeter loci circles), and can be constructed with only a compass and straightedge. If the small circle is one unit in diameter, the outermost perimeter circle is eight units in diameter, the circle passing through the perimeter loci is seven units in diameter, and the inside boundary circle is four units in diameter. Since the square can be devised using only a compass and straightedge, the whole pattern can, as well. Hexagons, too, though any pattern or polygon that can’t be made with a compass and straightedge also cannot here. Then again, why would you want to use a design like that? You silly thing. It would seem that the circle itself is an interesting add-on to the Babalon Matrix orgone system, and even though not essential, it does have some useful applications. Moreover, the circle designs themselves work as field generators, either for a concentrating spire or radiating sphere, and given their generic geometric form, can be applied in various other ways I can think of. They’re original patterns, as far as I can tell, and rely only on their geometric proportions and layout, so they’re tradition-independent and can be used by anyone interested in this. If you make use of these designs or make new variants of them, feel free to let me know and share what your own experiences with it are like. For convenience, I’m uploading the designs to the Designs page. What I’m really interested in figuring out is what to call these things; so far I’ve been calling them “charging circles”, but that’s both inaccurate and tacky. Magic circuits, force circles, and the like are possibilities, but we’ll see. This is very interesting research, have you tried using the “Flower of Life” formation? I know you are more familiar with the renaissance era, so you’re research seems to flow in that geometry. Try using a pattern such as the Flower of Life, or fractal double helix’, then building to the structure as you did with the Babalon Matrix. I feel, that like water, energy needs natural curves instead of masonic angles, to remain healthy. It may be less controllable as the energy is in free motion, though, the energy produced may be more intense. With the experiments I’ve done so far (post forthcoming), the sphere model of the circle actually does provide an airy or windy “flow” as opposed to the sharp or fiery “flame” that the spire model provides. I haven’t tried using the Flower of Life pattern, or its derivatives, and don’t foresee myself doing so in the near future, since it doesn’t seem to take on any focus or guides (which is what I want to work on). Those are a kind of “infinite matrix”, as I see it, and I have a hunch it’d end up grounding things out or locking things down as opposed to providing a free flow of energy, due to their infinite and repetitive nature; however, this is just what I get off of the “feel” from the design itself, so I may be wrong. Energy can flow freely, sure, but it’s more powerful and useful when directed; computers and electrical systems, for instance, use a system of rigid wires and circuits (which provided the initial inspiration for these circles) as opposed to letting electrons flow freely through metal bars. It’s…not, nor was it based on the tesseract nor for working with any higher dimension or spiritual plane. Intrestingly, I use a Hexagram circle that is similar in layout. In my experience, the inner circle’s diameter is defined by the mass of the object to be prepared in grams, divided by Pi. This is the inner circle’s diameter in inches. At least for Red Magick, Alchemy. You should try the metatron’s cube, as it does have focus points, as it is made from 13 circles with all their centers connected. 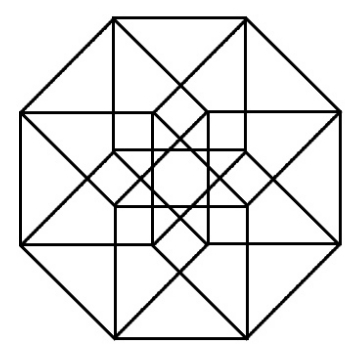 Metatron’s cube never really appealed to me as a design, and it’s based on much different principles (based on the Flower of Life) than the force compasses described above. I can see how they might be similar in appearance, though. @ polyphanes… I Don’t Understand!!?? I’ve read everything on this page. How are you calculating results??? What are you observing to define these results??? I not judgemental also, I understand some meditation techniques and practice a little bit. I’ve been designing a symbol and realized that in an honest attempt to create a symbol of self expression I have been on a journey that lead me to understand ancient symbols in some weird inner process. I am new to symbology and I am new to studying religions of all sorts including Buddhism, lucifarianism, and magic based religions. I am very open minded (Ex-Catholic, since early teen years) non-conclusive and at the entryway of a very exciting journey…. I am going to be very blunt!!! Are you claiming you perform real magic while doing whatever it is you do with these diagrams. Not tv ‘illusionist’ type magic but real magic, defying the laws of what textbook science says energy does/can do? I’m not calculating or quantifying anything. My method of observation is strictly based on my sense awareness of the energy flows present in these experiments; it’s entirely qualified, not quantified. Yes, I do “real magic” with these diagrams, as I do magic with other patterns, symbols, and signs as the need arises. These types of patterns are tools, as much as a wand or talisman, and used for a specific end. This energy is emphatically not the same energy as described by physics or chemistry; I keep material science separate from spiritual science, and I do not conflate magnetism, electricity, quantum whatever, etc. with spiritual forces. I get the feeling that you may have stumbled across this page on its own, in isolation from the rest of this blog. Take a look around and read some of the other things I do to get more of a context for this.